The New Year brings with it an abundance of hopes, dreams and opportunities. For many, it feels like the reset button has been pushed and we get a chance to do things differently, better than we have in the past. Increased physical activity and improved physical health often top the list of our resolutions but for us Upstate New Yorkers, braving the cold winter months can make it difficult to want to get outside. But cold and snowy or not, there are a plethora of calorie-burning outdoor winter activities that you can take part in as part of a group or alone to make the winter months fly by and those extra pounds disappear for good. Snowshoeing: This is a great activity for the beginners among us because the level of skill required for success is relatively low and the equipment needed is limited. Given that most year-round residents in the northeast are at least minimally equipped for winter, snowshoes are really all that you need (although some prefer to use poles to help keep themselves balanced) to get started. Additionally, many parks offer daily rentals as well as trails so you can give them a try before committing to purchasing your own. As an added perk, snowshoeing can burn up to 600 calories an hour. Cross-Country Skiing: Another beginner level outdoor winter activity that many enjoy is cross-country skiing. While there is a bit more equipment required for this sport, like snowshoes, it can often be rented on a daily basis, which minimizes your initial financial investment. This is a great, low impact activity that can be enjoyed on any relatively flat surface and burns upwards of 700 calories an hour. Ice-Skating: For the balanced challenged out there we advise you to proceed with caution but encourage you to proceed nonetheless. 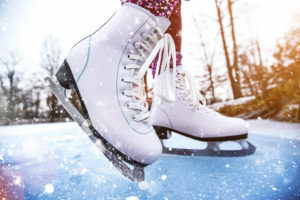 Ice-skating is an activity that can be practiced both outdoors and in (providing you have access to a rink) and will undoubtedly test your ability to stay upright. Much like snowshoeing and cross-country skiing, skates can be rented for a small fee (which makes this a fun and inexpensive date night idea for those that are able to laugh at themselves). Additionally, ice-skating can burn up to 500 calories an hour or more. There are so many excellent outdoor activities to enjoy this time of year that keep us active and moving towards our goals for the New Year. Even if you’ve never ventured outdoors during the colder months we are equipped to get to you ready from head to toe with our Patagonia line of outdoor wear, available exclusively at the Speculator Dept. Store. Stop in or give us a call and we will make sure that you’re ready to go for your next outdoor adventure.